The best way to start off your day is with a protein packed breakfast. Here is a quick and easy recipe to get in some plant based protein. 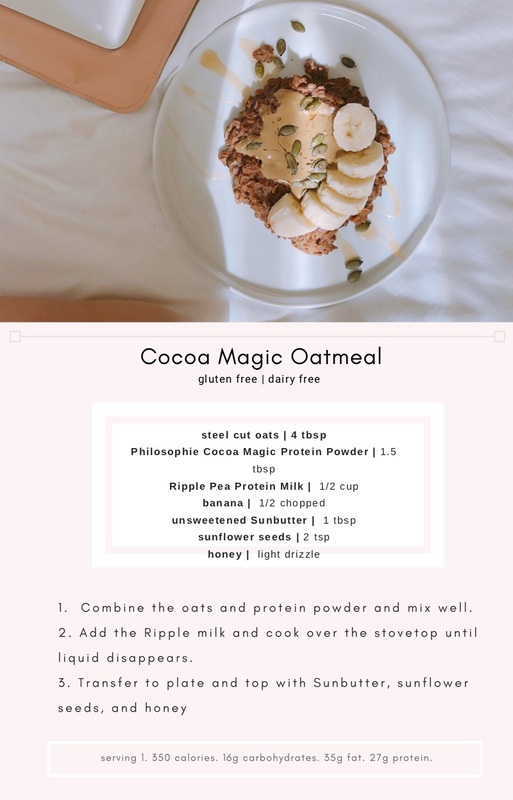 The Philosophie Cocoa Magic Protein is a must! It’s made from hemp and has a fantastic superfood blend of maca, reishi and mesquite that gives you all the energy you need to get through the morning. Mix it with some Ripple pea protein milk, and you got yourself a powerful breakfast that will keep your blood sugar stable longer. Blood sugar plays a major role in weight loss and especially hormone health. If our blood sugars are constantly going up and down from skipping meals or eating too many processed foods, it’s going to wreak havoc on our hormones and ultimately make us gain weight. Be sure to choose foods that are rich with protein and fiber, like the ingredients in this recipe, to keep you healthy and balanced.